Although red kites have bred successfully in Northern Ireland since 2010, up until now, all breeding birds have been from the 80 wild-born kites which were brought over from Wales and reintroduced between 2008 and 2010. It hasn’t been until this year, when Brown/White 34 (its bird name) was found to have bred at a site on the southern edges of the Mournes, that this milestone has been confirmed. 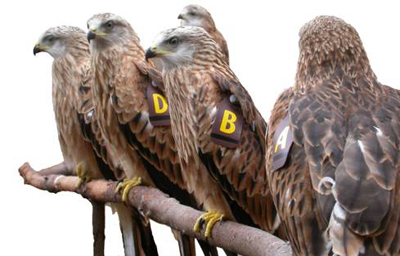 Young red kites pictured in Wales prior to being taken over to County Down. Even better news was that his mate, Pale blue/White Z, is a bird which had originally been released in Wicklow as part of the reintroduction by our project partner, the Golden Eagle Trust. It was great to finally nab one of their birds! Back at the start of March, it appeared as though White Z had paired up with a different male, Blue 25, and the two were holding a territory in a wooded valley near Rostrevor. Following the ‘big snow’, however, it emerged that White 34 was the preferred mate of choice and on 9 April, I saw White Z dropping into a newly constructed nest in a large oak tree. She was first recorded sitting ten days later on 19 April, although a third bird, which turned out to be Blue 25, continued to reside in the same valley. The continued presence of Blue 25 within their territory caused a bit of a nuisance for White Z and White 34 and the two were regularly recorded leaving the nest unattended to chase him off when he got too close. By the end of May, the pair were spending longer and longer off the nest and by the start of June they appeared to have abandoned their breeding attempt altogether. In early June, knowing they had abandoned the nest, I accessed the nest to see if there was any sign of eggs or evidence of why they may have given up. As I reached the nest and peered over the side, I was delighted to discover they had, at least, managed to lay a single egg. The pair built a fantastic, text-book kite nest, lined with wool and constructed in the fork of the tree. It’s not uncommon for birds of prey to fail at their first breeding attempt, perhaps due to a mix of inexperience and youthful exuberance. The fact they managed to get to the egg stage means I have big hopes for them next year and that 2014 will bring them more success. Northern Ireland Red Kites is the first species reintroduction in Northern Ireland and part of an All-Ireland project to bring back these wonderful birds to our shores. Project partners are the Welsh Kite Trust, the Golden Eagle Trust and the Royal Society for the Protection of Birds. Sadly, since January this year, we have recovered five dead red kites in Counties Antrim and Down. Three of the birds were breeding adults and were all located within a small geographical area of the same valley near Castlewellan. Two of these were males which had successfully bred in previous years and the third was a female, recovered dead on her nest during routine nest visits to monitor productivity and ring and wing-tag chicks. The other two birds were juveniles with Red 56 being recovered near Rathfriland in early April and Yellow 1D being found by hillwalkers near Larne in Co. Antrim in mid-August. In a cruel twist, Yellow 1D was the offspring of Blue 12, one of the adults found near Castlewellan, meaning that not only have we lost a successful breeding male we have also lost a potential future breeding bird. These deaths represent approximately 30% of the known breeding population of red kites in Northern Ireland and is a devastating blow to Northern Ireland Red Kites. Having gone two years with no recorded incidents, this rise in deaths is very worrying, especially the concentration of incidents near Castlewellan and we are working closely with PSNI to establish what has happened and prevent any further cases such as these. Emma Meredith, PSNI wildlife liaison officer, said: “Police take wildlife crime seriously and if it is found that there is a breach in the legislation then they will investigate. Currently police have requested tests on the birds reported to identify the cause of death. Information on the safe use of rodenticides is available by calling RSPB NI on 028 9049 1547. There has been great news from our project partner, the Golden Eagle Trust. Two wild White-tailed Eagle chicks have successfully fledged in Ireland for the first time in over 110 years. Three pairs of WTE attempted to breed in Counties Kerry and Clare this year. One pair failed during incubation and another, which nested in Killarney National Park, hatched at least one chick. Sadly, shortly before it was due to fledge, the chick died as a result of the nest collapsing, most likely due to the nest material (vegetation, sods and dead branches) dried out and shrinking during the long, dry spell of weather in July. The third, and successful pair, nested at Mountshannon in Co. Clare. This is the same pair which made history in 2012 when they nested for the first time, although they failed to hatch chicks during that attempt. The two chicks are expected to stay around the islands and western shoreline of Lough Derg, until sometime in the autumn when they will leave their parents’ territory and begin a 3-4 year nomadic life before settling on their own separate territories and attempting to breed themselves.